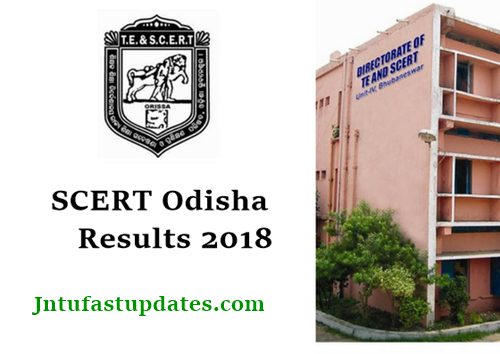 Odisha SCERt Results 2018 & Score Card Download: The State Council of Education Research and Training panel has conducted the B.Ed entrance test from 8th August to 14th August & 16th august for aspirants seeking admission. This year a large number of hopefuls seeking admissions in Bachelors of Education (B.Ed) course have completed for the admission test. Also, the admission tests for other courses of M.Ed, D.El.Ed, B.H.Ed, B.P.Ed, M.Phil courses have been organized by SCERT Odisha. Lakhs of hopefuls have competed to get admission in various courses. Based on the rank of aspirants the admission will be offered for the competitors. The organization has already released the SCERT B.ed M.Ed, D.El.Ed, B.H.Ed, B.P.Ed, M.Phil answer keys soon after the examinations completed. Hopefuls who have appeared for the tests have cross-checked the answers with the official answer keys and estimated the probable score that is going to be obtained in the test. Ans here is the news for the competitors who are keen to check Odisha B.ed entrance test results. The SCERT is soon going to roll out the results on its official portal, scertodisha.nic.in. Hopefuls can stay checking the portal to check the result, rank, and score. More details of SCERT Odisha result 2018 were mentioned here in this article. The SCERT Odisha has conducted the entrance test for admission into various courses D.El.Ed., Diploma in Art Education (Visual), B.Ed. (Bachelor of Education), B.H.Ed., M.Ed. and M.Phil (Education) courses. Odisha SCERT annually conducts the admission test for admission into B.Ed, M.Ed, D.EI, ED courses. The seats offered are 6,650 seats in D.El.Ed. course, 2,000 seats in B.Ed., 250 seats in M.Ed., 50 seats in Diploma in Art Education (Visual), 75 seats in B.H.Ed, and 36 seats in M.Phil. Based on the merit of competitors the SCERT Odisha will allot admission into various Educational Degree courses. As per the organization claims, this year the competition is high for SCERT Odisha entrance tests. A huge number of interested aspirants have enrolled for the SCERT screening test and has appeared for the test as per the allotted slot from 7th August to 14th August. All the competitors who have competed for SCERT Odisha screening tests can expect the result shortly. All the hopefuls competed for the SCERT Odisha entrance tests in the month of August can download the results in 3 to 4 weeks of the examination (approximately). Candidates can download SCERT Odisha result, scorecard, and rank card at the time of result. The result will be announced on SCERT official website, scertodisha.nic.in. Keep checking the portal to check the result date. The State Council of Education Research and Training, Odisha is going to announce the cutoff marks/qualifying marks of the all the entrance tests which were organized in the month of August. Candidates scoring the minimum qualifying marks/cutoff marks in the test will be eligible to get admission in various courses in Odisha state. The organization will announce the cut off marks along with results. Hopefuls have to stay patient until the organization announces the result, cutoff marks on SCERT Odisha official website, scertodisha.gov.in; soon after the organization announces details we will update on our page. Stay associated with our page for latest updates. The SCERT result, score, rank, and cutoff marks. After checking the result, take a printout for further reference. scored 43 in D.El.Ed OBC science categoty. my rank is 2527. Will i get a seat?? When the d.el.ed. merit list published…..
How I know either I select or not after knowing the entrance mark ? When the result is coming?? someone reply plz.